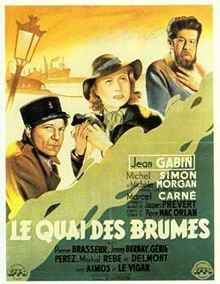 If you want to find the provenance of the final scene of Godard’s A Bout de Soufle (Breathless, l960), in which the dying Jean Paul Belmondo is cradled in the arms of his American femme fatale Jean Seberg, see Marcel Carne’s Le Quai des brumes (Port of Shadows (l938) now playing at the Film Forum. In this case it’s Jean Gabin lying in the arms of Michele Morgan on the cobblestoned streets of Le Havre. Michel Simon, the star of Renoir’s Boudu sauve des eaux (Boudu Saved from Drowning 1932) plays the role of a murderous lover of beauty. The great Jean Gabin who would later star in the movie version of Zola’s La bête Humaine (1938) is an AWOL soldier and Pierre Brasseur who would play the actor, Lemaitre in Carne’s great masterpiece Les enfants du paradis (Children of Paradise l945) is the cowardly gangster. Fog, leafless trees, rain slicked highways, and steam ship smoke stacks sounding off urgently as shots are fired all are part of the making of an impressionistic landscape that’s been termed “poetic realism.” In actuality Le quai des brumes might be termed an ode to French iconography. Amongst these are a cigarette perpetually hanging out of the side of Gabin’s mouth, a stray dog, an orphaned girl, an artist who explains his suicidal impulses by saying, “you have to kill someone,” a drunk trying to drink out of wine bottle which encases a miniature boat, a script by Jacques Prevert, a score by Maurice Jaubert and naturally the lone word “Fin,” with which all the great films of the black and white era end. Le quai des brumes, c’est Francais!